Intuit Subscription pricing, packages, features, functionality, service and support options are subject to change without notice. Our Silver subscription provides QuickBooks Enterprise software, Full Service Plan benefits,and Advanced Reporting. This subscription provides the functionality, support, and business insights to get started on Enterprise. Our Gold subscription provides everything in the Silver subscription and adds in QuickBooks Enhanced Payroll for unlimited employees – no monthly fees. This level allow you to easily pay employees, pay and file taxes. Our Platinum subscription provides everything in the Gold subscription and adds in exclusive functionality of Advanced Inventory and Advanced Pricing. This advanced functionality is particularly advantageous for manufacturers, wholesalers, contractors, and retailers. The Full Service Plan provides exclusive benefits such as U.S.-based customer support, the latest product upgrades, online backup storage, and our all-new Advanced Reporting, our most customizable reporting tool, plus much more. Intuit announced on October 6th 2014 that it will no longer sell traditional Software licenses for it flagship product, QuickBooks Enterprise. Instead, Intuit will offer its product only as an annual subscription with maintenance and support being included in the pricing. 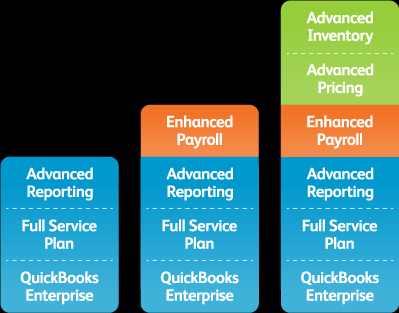 Until October 6th, customer were already purchasing the QBES add-on modules from Intuit, called Advanced Inventory and Advanced Pricing, as a annual subscription. This pricing model has been extended to the main product itself. For questions, please feel free to contact us at Tel. (714) 901-5740.